AT PADDINGTON. The London terminus of the Great Western Railway has twelve terminal platforms to deal with long-distance and local trains, which total about 840 daily. This photograph shows the great station, which covers an area of approximately thirteen acres, at the peak of a busy period. THE problem of the railway rush hours - in London, Paris, Berlin, New York, Buenos Aires, Melbourne, Liverpool, Manchester, Glasgow, and in almost every other city of first-class importance - can be summed up in the homely phrase “trying to get a quart into a pint pot”. 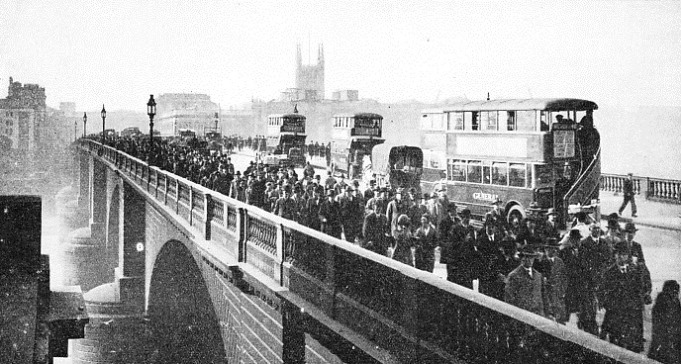 It is largely a modern problem, in the sense that, although traffic congestion is no new thing, and gave rise to complaints so long ago as the days of Queen Elizabeth, the mass movement of passengers within a restricted period of the working day belongs to our own times. The rush-hour problem differs essentially from any operating difficulty encountered in connexion with goods traffic. Minerals and merchandise can generally be handled when the tracks are relatively free from traffic of other kinds. Provided a goods train reaches its destination in time to suit the convenience of the consignees of the merchandise, the precise hours of its arrival and departure are not of the first importance. On the other hand, the whole of the passenger rush-hour movement must be accommodated within precise and narrowly fixed time limits. Rush-hour traffic is both urban and suburban, but much of it also comes within the long-distance category, because of the modern tendency for regular passengers to live away from the towns and cities in which they work. An excellent example is the heavy season-ticket traffic between London and Brighton. Such long-distance rush-hour traffic has to be handled on main lines dealing also with long-distance expresses, and with goods trains, a fact that has for years been responsible for some of the greatest difficulties encountered by railway administrations. Reference may be made, by way of illustration, to the London and North Eastern Railway’s main line approaches to Liverpool Street. Both the tracks and the stations are more than equal to the demands of the long-distance traffic; but during the morning and evening rush hours, and in the early afternoon on Saturdays, the maximum capacity of the lines is inadequate to the traffic. Hence, railways all over the world have been obliged to go to enormous expense and to lay down additional running tracks, enlarge stations, lengthen existing platforms, and build new ones merely to provide for the traffic requirements of four or five hours out of the twenty-four, while during the remaining nineteen hours or so the train service and track capacity may be much in excess of traffic needs. A special feature of suburban rush-hour traffic, and one that has not received adequate consideration, is its continuous tendency to extend over longer distances. This is due to three causes - the extension of the Tubes, the growth of railway electrification, and the remarkable development in recent years of new residential suburbs outside London and other great cities. Watford, Morden, and Edgware are familiar examples. On the other hand, it should be emphasized that the better facilities and quicker and more frequent services offered by the railways have led to the opening up of these outer suburban residential areas. All transport problems are ultimately reduced to a question of money. In dealing with rush-hour traffic, the financial problem is to handle the maximum number of passengers, while going to the minimum expense in the provision of extra facilities. Improved signalling methods, with or without electrification, non-stop trains, “staggering” the train service, and reversible working, are among the methods adopted. RUSH HOUR IN BUCHAREST. The rush-hour problem is an international one. The Romanian railways recently inaugurated a service of excursion trains from Bucharest to the surrounding holiday resorts. 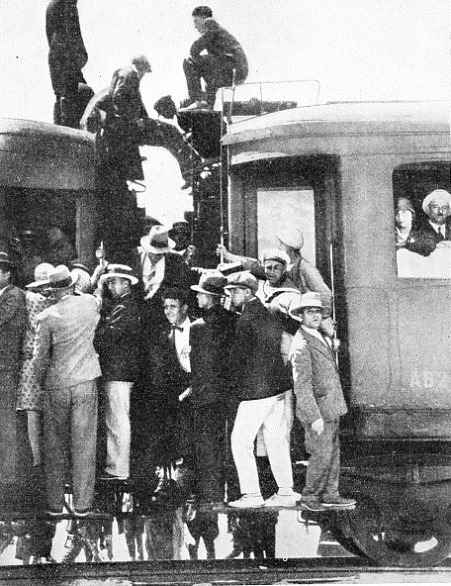 Above is a well-packed train just before it leaves the city for the country. The effect of modern signalling on accelerating traffic movements is not always appreciated. Signals were originally introduced for the purpose of controlling trains and increasing the margin of safety; yet, given certain operating conditions, it is possible to work a railway safely without the use of signals. But it would be impossible to handle the traffic on the London Tubes, or in and out of Waterloo Station, for example, without them. Since the Metropolitan District Railway was electrified, the maximum number of trains that can be handled on a single running track has risen from approximately sixteen to forty an hour. Electrification, with its greater acceleration and deceleration, has, of course, been an important factor in bringing about increased services, but the existing services could not have been provided without the use of automatic signals. Among other advantages, they enable much shorter block sections to be used than is customary on main lines. In fact, the twentieth century signal has made possible the efficient traffic handling of today. Reversible working, which has been used in New York and on the Brighton section suburban lines of the Southern Railway, normally demands the provision of at least three running roads, that in the centre being used for “up” traffic in the morning, and for “down” trains at night. It involves, of course, a special signalling installation capable of controlling traffic in either direction, but the cost of the additional signals is small in comparison with the alternative of laying down additional running tracks and enlarging stations. Reversible working represents, however, a specialized method of operation, and is not employed to any very considerable extent at the present time. Both London and New York furnish examples of non-stop train-working on urban lines. This method is employed also during the slack periods. The term “non-stop” in this connexion has a specialized meaning. It does not refer to long-distance expresses such as the “Royal Scot”, the “Cornish Riviera”, or the “Flying Scotsman”; but merely denotes a train that does not follow the general rule of stopping at every station. For instance, a number of the Central London Railway tube trains do not stop at Lancaster Gate, where the traffic is light for most of the day. On the Piccadilly Tube a still larger number pass Covent Garden, where the passenger movement is largely dependent on the hours of business of the fruit and vegetable market. “Staggering” is a variant of the non-stop service. The working out of the principle alters in accordance with the traffic conditions and requirements; one method is to arrange the service on a given section of line so that, for instance, one train stops at the second, fourth, sixth, and eighth stations, and the next train at the first, third, fifth, and seventh, and so on in regular alternation. But, in conditions of really intensive traffic working, it may be easier to adopt this method during the slack than the rush hours. On short lines having stations close together the fastest and densest service is not always given during the rush-hours. On the Central London Railway, for instance, the maximum service, with a time interval of only ninety seconds between trains, is run during the slack period, while the end-to-end run on this line takes less time on Sundays than en weekdays. The reason is easily explained: during the slack hours there are fewer passengers, and thus the duration of the station stops can be reduced. The London Underground railways have to cope with a rush hour difficulty from which the main lines are for the most part free - the shortness of many of their platforms. On the principle of the strength of a chain being that of its weakest link, the maximum length of the trains that can be operated on a tube railway depends on the length of its shortest platform, since when trains are brought to a standstill no part of them must be in the tunnel. On the Central London, the make-up of the trains during the rush hours does not exceed seven cars, as against eight larger and more spacious vehicles on the Metropolitan District. If the Central London could run as many cars to a train as the District, the effect would be to lessen some of the present overcrowding during the rush hours; but it does not follow that the provision of extra coaches would allow acceleration of service. On the contrary, longer trains tend to increase the duration of station stops. The general principle on the Tubes is to provide adequate seating during slack hours, and for the outer suburban workings, and ample standing space for rush-hour traffic. This permits the highest speed of travel to be maintained. For the very short distances often travelled, many of the passengers prefer to stand so as to be near the door. 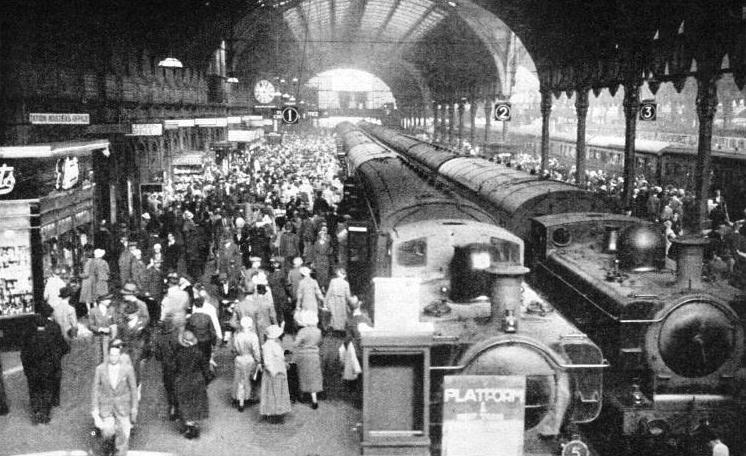 9.30 AM AT LIVERPOOL STREET STATION sees crowds leaving this important LNER terminus for their offices. The station, opened in 1874, was formerly owned by the Great Eastern Railway. Doubts were at first entertained as to whether there would be sufficient traffic to justify its construction. To-day Liverpool Street handles over a thousand trains in twenty-four hours, and it is calculated that 200,000 people use the station each day. Besides these facts the extension of Tube platforms is costly. On weekdays the line is operated for about twenty hours out of the twenty-four, leaving only about four hours for reconstruction work. Of this brief period a part is absorbed for “making ready” after traffic has shut down and in dismantling the gear before the current is turned on again in the morning, so that less than four clear working hours in each day are left. The Central London affords a striking indication of the true nature and meaning of the problem of the rush hours. But that problem is everywhere substantially the same. There is hardly a railway in the world handling a very large urban or suburban passenger traffic that could not carry all its passengers with ease if the movement were uniformly spaced out during the working day. The rush hours have tended during recent years to encroach on more of the working day, as far as short-distance traffic is concerned. One cause is the growing popularity of the season ticket, especially the weekly season, which is used by large numbers of people for shopping purposes during the luncheon interval. The cinema is another cause of this encroachment. There is a tendency among people who live in the suburbs to come into London and other large towns for the early evening cinema programmes just when the business rush hour is decreasing. This is a recent tendency and at present a minor one, but one that might in time cause another rush hour. Already this early cinema traffic contributes to the rush hour that has always been caused by the normal homegoing theatre and cinema traffic. This last is an example of the many social changes that create fresh phases of the rush-hour problem. Another, in recent years, is the earlier closing of shops and offices, which puts forward the beginning of the rush-hour period. Here it may be remarked that in one important respect the English Saturday half-holiday habit has created operating difficulties in this country to which there are few parallels elsewhere. The effect of the half-holiday is to make most of the period between the early morning and the early afternoon a rush-hour period; thus the Saturday time-table differs materially from that of other weekdays. 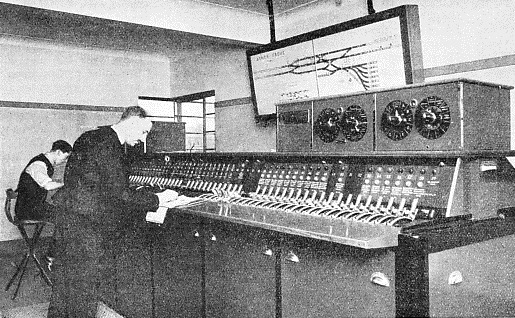 THE INTERIOR OF THE SIGNAL CABIN at Arnos Grove on the Piccadilly Line, London. The track on the diagram is divided into lengths showing the various track circuits. When the track is unoccupied the electric lamps illuminate that section. The Underground, aided by automatic signalling, to-day fights an unceasing battle in its daily handling of an enormous “rush-hour” traffic. Facts of this nature arc generally overlooked when railways are criticized for their inability to provide every passenger with a seat during the busiest hours. To do so is possible only at the cost of enormously expensive undertakings such as building a second two-track tunnel beneath the most congested section of the District Railway. It was for the same reason that for many years the London and North Eastern Railway had decided against any scheme for electrifying its suburban lines in the London area. 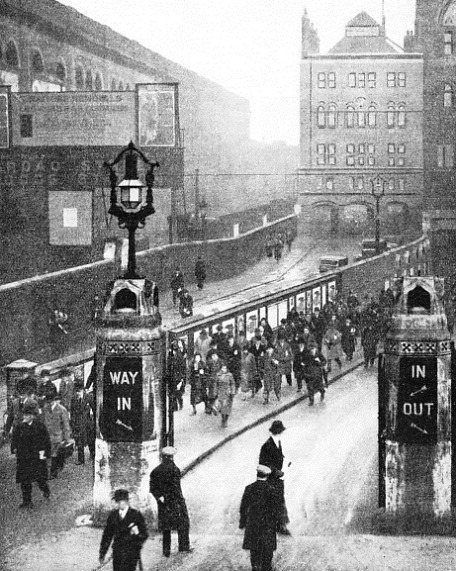 Where railways have embarked on expenditure to cope with rush-hour congestion, the outlay has often been incurred not because it was thought that it would be recovered in the form of additional traffic, but because it was forced on the management as the only means of dealing with a serious problem. Appliances such as escalators, pass meters, and automatic ticket machines help to relieve congestion at stations, and to that extent they play their part in solving the rush-hour problem. Ultimately, much depends on the passenger himself, and the London Underground railways have for years been trying to educate the public to cooperate by such means as entering and leaving the trains as quickly as possible. Mechanical devices are also coming more and more into use for the purpose of speeding up station working. One of these is the so-called “platform hustler”, a siren that sounds automatically as soon as the train has stood at the platform a predetermined number of seconds. A variant of this device consists of a number of metal rods connected by a cable and slung from the station roof. Attached to the cable are two wires that are electrically connected with a bell at the other end of the platform. When the guard is ready to start his train, he touches both wires with the metal handle of his flag, and the bell rings, warning both driver and passengers. Practical tests have shown that a train can be started more quickly in this manner than by the old-fashioned guard's whistle. These two appliances are in use on the District Railway. A special device is also used on the Tubes for quick starting, which is of special value where the station is on a curve, so that the conductor in the leading vehicle cannot obtain an unobstructed view of the platform, when there would be some delay in giving the “right away” signal. To overcome this difficulty, the newest type of car is fitted with a small box containing a projecting plunger rod. This can be operated by a platform porter or other station official immediately all the passengers have entrained, when the operation of the plunger gives the signal to start. RESERVED SEATS are a wise precaution for the long-distance traveller at busy periods. 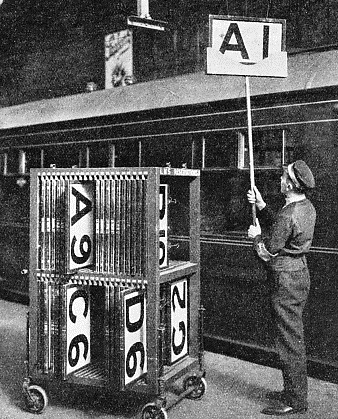 A porter is here fixing the indicator-board beside a coach on an LMS express at Euston. This sign enables the holder of the reserved seat to see at a glance which section of the train to enter. The automatically operated doors with which the Tube coaches are equipped also make for quick loading and unloading. Indeed, the existing time-tables would be impossible without this device. Here we have yet another example of the extent to which operation during the rush hours can be speeded up by mechanical devices at relatively small expense. It is, of course, far cheaper to improve rush-hour working in this way than to build additional running tracks or to enlarge stations. While, for example, the equipment of the Metropolitan and District has been transformed out of all recognition since steam days, traffic is handled over the central sections on the same tracks as before, and the stations on this section have been improved rather than enlarged. On the steam lines, the rush-hour problem varies in important details, although it still remains a matter of the quart in the pint pot. As already mentioned, much of the rush-hour traffic worked by the main line companies has to be handled on tracks that are also called on to accommodate goods and long-distance passenger trains, a fact that obviously adds to the operating difficulties. Another point that must be considered is that on certain lines - such as the Southern, the London Midland and Scottish (former London and North Western section) between Euston and Broad Street and Watford, and the Newcastle-on-Tyne section of the London and North Eastern Railway - the passenger trains are worked partly by steam and partly by electricity. With every extension of electrification, this dual working becomes more pronounced. To a certain extent, it also simplifies operation during the rush hours, since the multiple-unit system of electric traction eliminates the necessity for shunting or “running round” of locomotives at terminal stations, and thus enables an arriving train to be restarted in the opposite direction within a much shorter time than is possible with steam traction. One result is that at such stations as Victoria and Waterloo the platform tracks are largely used for both up and down traffic, which tends to simplify working during the most congested periods of the day. The main lines have certain operating advantages over such purely short-distance systems as the London Tubes. Their stations are normally farther apart, and their principal approaches to London and other large cities have four or even more tracks. For instance, practically the whole of the seventy-five mile stretch between St. Pancras and Glendon North Junction, Kettering, on the Midland section of the London Midland and Scottish Railway, is four-track. So, also, are the sixty miles on the London and North Western section of the same system between Euston and Roade, the fifty-six miles on the Great Western between Paddington and Steventon, and the fifty-one miles on the London and South Western section of the Southern between Waterloo and Battledown Junction, Basingstoke. With minor short interruptions, also, the LNER main line is quadruple from King’s Cross over the first one hundred and five miles to Grantham. Among the alternative approaches are the two into Marylebone, one of which also gives the Great Western a second set of running tracks for its London and Birmingham traffic; and the Cuffley-Hertford line of the London and North Eastern, which in effect provides the Great Northern section with a relief route to the main approach to King’s Cross. Another advantage possessed by the main-line railways is that track widening and station enlargement are much cheaper on the surface than below ground. One of the difficulties on the Metropolitan Extension line - which handles both short and relatively long-distance traffic, and is also worked both by steam and electricity - is that while the Extension station at Baker Street has four platform tracks, and there are four running roads between Finchley Road and Harrow stations, the whole of the heavy traffic between Baker Street and a point midway between Swiss Cottage and Finchley Road stations has to be carried over a two-track bottle-neck. The London Passenger Transport Board has, however, put forward a scheme to remedy this. OVER LONDON BRIDGE. Business people streaming over the bridge in the morning towards the City after they have left London Bridge Station, which is situated on the south bank of the River Thames. Approximately 2,400 trains are dealt with every day by the Southern Railway at London Bridge Station, which has fifteen terminal platform lines.